The Midterm deadline is April 22, Friday a week from now. No late work will be accepted after this date. We wrote our “DOOM” deadlines on the board. For science and Utah Studies (or Geography), the study guide is due on 4/22. In math, we only have our regular, daily homework due. Our entire unit for language arts is due 4/22. Peer edit #4 is due today, and the entire unit is due in a week, on Friday. For our next unit, the last of the year, we will be working on reading comprehension. We will focus on locating facts within a text, and using the SQ3R method effectively. Please remember to bring a book or magazine to class. We have time at the beginning of the period for you to read something fun–but you need to be bringing something, or you’ll be stuck reading something from my library bag. Authors! If you have a writing project that you have been eager to start or would like to work on, I will also accept proposals for individual, alternate units for our final month together. 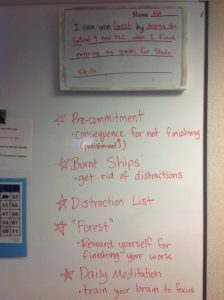 Your proposal needs to include weekly milestones, and a plan for what you will do in class. Remember that computers are not always available, so do not plan on typing unless you have an approved device from home to use for this. Please turn in your plan by Thursday, April 21. For most of us, the thing that keeps us from getting our schoolwork done is difficulty focusing. We watched Thomas Frank’s “5 Ways to Build Focus and Concentration.” from https://www.youtube.com/watch?v=a-KCZ1sghLY&list=PLx65qkgCWNJIS5Y_CcxifKHjQKf7iqVv5 and discussed the ideas that Mr. Frank presented. If the assignment called “Focus” is marked as MISSING in Aspire, you still need to write down what tactic you think will work best for you, and how you can adapt it to school situations. We’re finishing up our unit on percents. Today we did a review (p. 70 or p. 71 in the ESM workbook), and we’ll have an open-book quiz on Thursday. As with all of our math lessons, if you were absent today, you will need to make up this work. Your workbook is available during math lab, during lunch, and before and after school, or you can make a photocopy of the page to take home. The skills we are working on are very important, and so you may not simply skip the work, even if you’re absent. Today in Reading Lab, we had a check-in for the third peer review.You were expected to have finished your creative choice, or levels A and B. Those of you who were completely unprepared had time during class to do a “hail Mary” and try to get something ready for Ms. Jessi’s class, when this assignment is due. As a class, we did the Venn Diagram for the Inside Out & Back Again unit. In order to complete this assignment, you still need to write a paragraph. We had work time today, and will have work time again on Wednesday and Friday to work on this. Our next peer edit is due on Friday. You are expected to have the Venn Diagram and paragraph completed. Today we read pages 83 – 143. Ha travels from Vietnam to Guam, and then on to Florida, and finally ends up in Alabama. She struggles with learning english, eating the food (missing her papaya!!! ), and being different from all her classmates. As we began class, we watched a newscast that described the process that Vietnam refugees went through when trying to get to safety. That video can be found at https://www.youtube.com/watch?v=E_i_HkeqN5E . This term, we are working on developing a growth mindset. Last week, we took a quiz, to determine our current mindset. If this assignment is marked as MISSING, you’ll need to make this up during class. It’s not an assignment that you can take home. We will take the quiz again at the end of the term, to see our growth. This week, we looked at how any situation can be viewed through the lens of “things we can control” and “things we can’t control.” We watched some people who were stuck on an escalator (https://www.youtube.com/watch?v=VrSUe_m19FY). We discussed how often we are “stuck.” We think that our problem is unsolvable, and we begin to panic or give up, like the people on the video, when actually, our problem has many solutions. We need to be able to shake off the panicked thoughts, and focus our thoughts on solving the problem. I challenge you: next time you think the thought, “I can’t take notes because I don’t have a pencil.” focus your mind on how you can solve the problem, instead of simply sitting there and waiting for your teacher to intervene. Our format for Math Lab and Ms. Marie’s math class has changed. You used to work on your Mastering Essential Math Skills book as homework for Ms. Marie’s class. Now, you work on it in Math Lab. Last week, we did pages 60 and 61. This week, we will do pages 62 – 65. These books remain in the P2C2 classroom, and do NOT go home. If you are unable to finish your work during class time, you will need to arrange time to come in and work. Advisory and lunchtime are both good times to use for this. Today, we read p 36 – 83, and had time to work on the assignment that is due on Friday. As we read, we continued to add to our list of metaphors for the assignment that is due next Friday.